I was almost out of bread again this week so I went to the bread store this morning. We seem to be going through more bread than usual lately. As you can see I bought many boxes of donuts. I gave some of those to my parents who came over today. Here is the breakdown of what I bought. For a Total of $9.89 spent. Do you have a favorite place to purchase inexpensive bread or do you make your bread at home? What great prices! 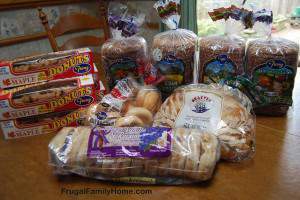 Organic whole wheat bread for under $1…that is awesome! I love our Bread Store the prices are just wonderful.